1. To foreshadow or to warn people that something is going to happen: The thunder and lightening portended that a storm was about to take place. 2. To indicate or to signify in advance: The icy roads and winter snow storm were portending several auto accidents. 3. To predict or to forecast: The economist on TV was saying that leading economic indicators were portending a recession. 4. 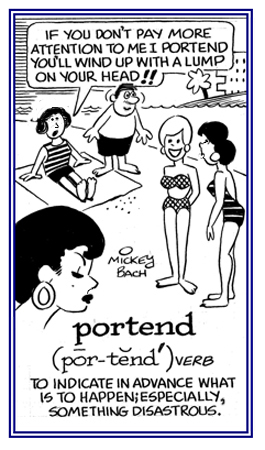 Etymology: from early 15th century, from Latin portendere, "to foretell"; originally, "to stretch forward"; from por-, a variant of pro-, "forth, forward" + tendere "to stretch, to extend." © ALL rights are reserved. 1. An omen that indicates that an event is about to occur; especially, an unfortunate one: When Kate slipped on the floor of the store, after coming in from the rain, she had the portent of severe injury to her right wrist that would result in pain for a long time while it was healing. 2. A sign or a warning that something which is usually bad or unpleasant is going to take place: The dark clouds and thunder and lightning were portents that it would soon be raining very hard. 3. 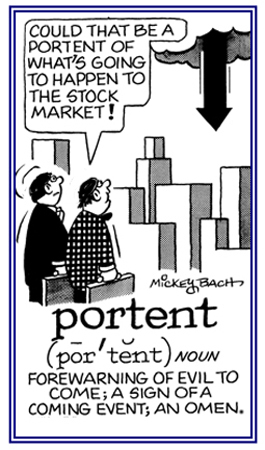 Etymology: from Latin portentum, "a sign or an omen" from portemdere, "to foretell or to predict." © ALL rights are reserved. 1. That which gives a sign or a warning that something which is usually undesirable or bad is going to happen rather soon: "She had a portentous dream that she was going to slip and fall down on an icy sidewalk and break her arm." 2. Arousing awe or amazement or trying to seem important, serious, or impressive: "The politician spoke in a portentous tone about the future of his country." A reference to statements or signs which are important because they show that something unpleasant is very likely to happen: "The economics minister talked portentously about the economic situation." That which is ominously significant or indicative of something that is about to happen: "The injury to the star football quarterback was a portentousness for defeat." 1. A shortened term for a person who is paid to participate in an activity or a sport: Jim is striving to become a tennis pro. 2. Anyone who has a great deal of experience or skill in some particular activity or work. 3. A person or side in a debate, argument, or campaign that is in favor of doing something. Referring to or typical of an activity, especially a sport, from which someone is paid and so earns a living with his or her athletic skills. Translation: "For the altar. For the hearth." Also "For the altar (church or religion), For the hearth (home)." Translation: "For the good of humankind [mankind or humans]." Motto of The Rockefeller University, New York, New York, USA. Translation: "For the public good." 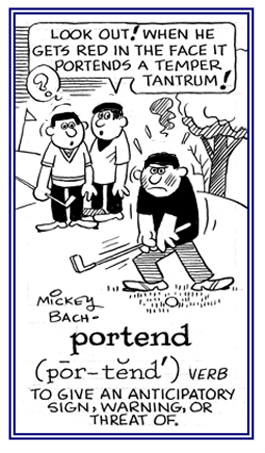 The full phrase for the expression of pro bono in English. There are some attorneys who devote a portion of their working time to legal cases in which they represent the poor or seek redress for public grievances, and a necessary condition of true pro bono work requires forgoing one's customary professional fees. Motto of Olivet College, Olivet, Michigan, USA. Motto of Geneva College, Beaver Falls, Pennsylvania, USA. For Christ and the Republic. Motto of Birmingham-Southern College, Birmingham, Alabama, USA. Motto of the University of Dayton School of Law, Dayton, Ohio, USA; as well as, Loras College, Dubuque, Iowa, USA. Related before-word units: ante-; antero-; anti-; pre-. Showing page 1 out of 15 pages of 215 main-word entries or main-word-entry groups.